The Terrifics #1 review: A well-crafted adventure that doesn't quite fit the "Fantastic" shoes it set out to fill – AiPT! DC’s answer to the Fantastic Four is here. DC’s very unsubtle but also very welcome attempt to fill the Fantastic Four-shaped hole in the comic book world has finally arrived! Is this super-science team-up of Mr. Terrific, Plastic Man, Metamorpho and Phantom Girl, courtesy of creative Jeff Lemire, Ivan Reis, Joe Prado and Marcelo Maiolo, up to the task? Yes and no. The team begins to form when scientist Mr. Terrific arrives at the lab of madder scientist Simon Stagg to recover technology Stagg stole from him, when he discovers that he used that tech–and Metamorpho–to pry open a portal into the Dark Multiverse that has been seen in Dark Nights: Metal. And that’s just in the first few pages. Readers of Metal will know that Mr. Terrific has recently been hanging out with a dormant, egg-shaped Plastic Man, and the two of them and Metamorpho soon find themselves pulled into the portal, and off an adventure of cosmic import. For minor spoilers’ sake, we’ll keep it vague and confirm that before the end of the issue, Phantom Girl has also joined the quantum quartet, and thus the team is assembled. Make no mistake, this is a well-crafted comic. Jeff Lemire is definitely the writer to take on this kind of throwback sci-pulp adventure, as he gets right to work establishing a good repertoire between the team members, and immediately whisks them away to a strange and distant cosmic locale. It’s good to see him back at DC with his first new series for the publisher in a while, after a stint at Marvel. Superstar pencil-inker team Ivan Reis and Joe Prado deliver the kind of well-crafted widescreen superhero comics that they’ve become well known for, and colorist Marcelo Maiolo complements the line art with a spectrum of bright and weird colors befitting the cast and setting. So The Terrifics have the wild adventure, the team dynamic, the strange science, and the A-list creative team, but it still feels like the recipe is missing a few ingredients. The origin story to this team already feels too rooted in the continuity of the last big event. If you’re not keeping up with Metal, I’m not sure how much you’d get out of the set-up, and if you aren’t already familiar with the characters, you aren’t given a whole lot of reason to care about them, and the last page reveal falls flat for much the same reason. Continuity reveals should never take the place of actual plot, and while that’s certainly not all this issue is, it has moments when it comes dangerously close. Another thing that doesn’t quite click is the tone. Lemire is writing a fun adventure, but Reis is drawing a big event. When I’d hope to see something presented with levity or wonder, it was often drawn with more dramatic gravitas. There already seems to be a few missed opportunities for humor between one shapeshifter (Plastic Man) annoying another (Metamorpho) that an artist with a lighter, pulpier style (such as Evan Shaner, who did the character designs and upcoming issues) might not have missed. Maybe these expectations for a lighter, more optimistic style are misplaced and stem from the Fantastic Four comparison, but it’s a comparison that DC readily invited. 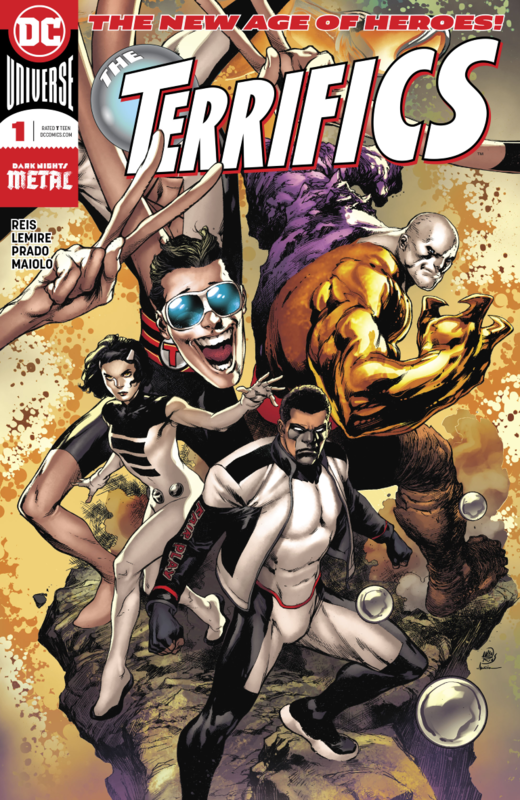 So while it’s an entertaining and nice-looking superhero comic with a refreshingly eclectic cast and mission statement, The Terrifics doesn’t quite fill the shoes that many fans might be expecting it to. It’s a solid book with lots of potential to grow, so with the set-up out of the way, if the book moves on from the Metal tie-ins to a brighter tone and more original stories, DC could have something special on their hands. The Terrifics has a solid story, an entertaining cast, and a talented creative team, but is weighed down by continuity and didn't quite live up to its potential.